Finding effective ways to problem solve is a powerful way to attract and retain top talent. When your company develops a reputation for having a culture that invites open, honest communication, you become a “destination employer.” Sometimes the solutions lie in the benefits you provide; other times they arise from supportive personal interactions with colleagues and management. Demonstrably helping employees with their needs can also have a positive ripple effect within an organization, helping to prevent disruptions in production and quality of work as well as increasing morale. SHRM recently released a report stating that “respectful treatment of all employees” was the No. 1 contributor to job satisfaction. And “trust between employees and senior management” was second. That’s an amazingly simple idea for a surprisingly common challenge. This means that above all of the perks and management tricks, treating each other with kindness and respect is what really matters. That’s why developing a culture of appreciation and trust should be a priority. A true dialogue only occurs if both sides are listening. When you’re actually listening to the other person, you’re not simply waiting to talk. Active listening makes people feel more comfortable sharing their concerns. This is a process that goes well beyond a single engagement survey. This is where you collect regular, ongoing employee feedback.. In the same way you nod to someone to show them you are listening, make sure employees see some kind of action associated with the feedback they give you. Well-intentioned feedback efforts can backfire if nothing is done with the information. Employees need to know that they’re being heard. Transparency goes a long way to creating a culture of respect and trust. People who respect each other ultimately support each other holistically, both personally and professionally. When employees feel confident that you’re listening, that you really do care about what happens to them, and you demonstrate that you will go above and beyond to help them, engagement soars and they’ll be fully engaged. 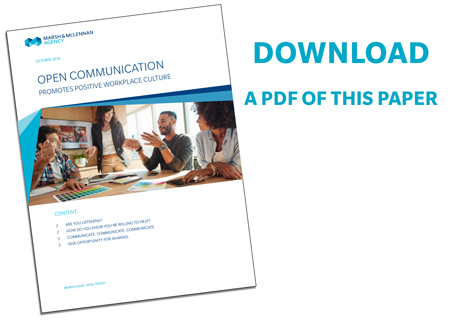 Developing a transparent culture where employees can give honest and direct feedback, knowing it will be heard and shared with the right people – and positive actions will be taken – is essential to getting them to talk about issues. When workers show respect toward one another employee engagement increase. When a manager shows his or her employees respect by example, it sets the foundation for a positive workplace culture. In 2017, the Society of Human Resources Management conducted a survey in which 72 percent of employees responding rated showing respect of all employees as “very important.” It was the top contributor to overall employee job satisfaction. Likewise, a survey by Harvard Business Review of more than 20,000 employees found that respect was the No. 1 behavior that leads to greater engagement and commitment. Good communication and collaboration starts at the top. Leaders need to build practices that strengthen relationships between teams. Once employees believe that it’s the way they’re supposed to work, they’ll be more open and engaged. So how do you show respect? It doesn’t really matter how you do it, whether through blogs, employee feedback programs, employee recognition programs or newsletters. It’s the fact that you’ve made a commitment to open conversations and transparency that matters. All it takes is a quick meeting. Share what’s going on with the business. Make employees feel as though they are part of the team, rather than cogs in the wheel. This helps establish a culture of transparency by setting the tone for your organization. By sharing important information in a straight-forward, candid way, you allow individuals to feel that they can do the same. Encourage interaction and questions. And remember to listen. Some people prefer to talk directly to a manager. Others prefer to remain anonymous. So, make sure you provide multiple ways to collect feedback, including regular manager meetings, suggestion boxes, etc. And remember, asking for feedback is great, but employees need to know you’re going to act on it, or why you’re not. In other words, don’t start something like weekly meetings and anonymous suggestion boxes, and then not pay appropriate attention to the suggestions. Keeping employees in the loop and making them feel as though they truly have a voice requires consistency. When all employees are able to offer thoughts and information, and speak up to management you’ll see the most growth, and you’ll attract and retain the best talent. Transparent environments matter a lot to the growing millennial workforce, and they’ll make up half your employees by 2030. Make sure employees have ample opportunity to explain their idea or position. Provide guidance. By doing so, you communicate care and respect. Make sure you’re all in this together. Rely on one another and get rid of whatever stands in the way of greater productivity and engagement. When you get people talking and sharing, you open a network for new ideas and better ways to run the business. As employee engagement increases, you will see stress levels reduce and knowledge sharing increase which can ultimately boost your organization’s bottom line. Engagement and respect foster a positive work environment where managers and employees alike become encouragers of others. People look forward to coming to work rather than dreading it and that shows in productivity and profit. Marsh & McLennan Agency has a long history of helping our clients analyze business problems and opportunities, and then helping them develop the right plans to take action. If you’d like to talk with us about what direction to take and how to create a culture of open and honest communication, contact your local Marsh & McLennan Agency representative. Workplace Harassment - Can You Practice Zero Tolerance?